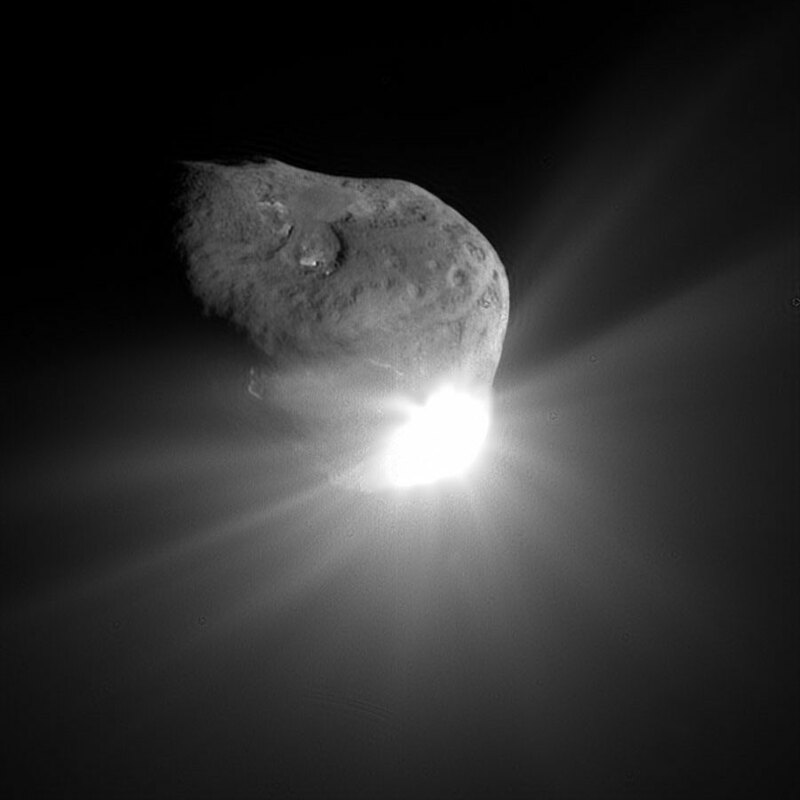 Collision between a comet and a 370 kilogram projectile exposes subsurface ice, causing large amounts of dust and over 250,000 tons of water vapor to stream off the comet. As a liquid that much water would fill over a hundred Olymic-sized swimming pools. NASA for now is sticking to Werner von Braun's World War Two vintage idea of lunar and Martian bases that import everything from earth -- including even such basics as propellants, tankage, food, air, and water. While these white elephants are still seen by most of NASA as the "next logical steps", there are a wide variety of other and often much better ideas for space development out there. I've long considered the possibility that comet mining, or similar drilling for any ice that might exist underneath the regolith of some asteroids (as we know it does on Mars), is a much more productive way to go. The argument for microgravity ice mining, laid out in the above-linked article, involves several steps of reasoning, but the most important parts of the idea are (1) that use of native materials, rather than hauling materials from earth, is crucial to productive and affordable long-term space development, and (2) that given the expensive bottleneck of launching from earth, the most important variable for space industry is the mass throughput ratio (MTR): the ratio of the mass of material processed per unit of time to mass of the (earth-origin) machinery required. Higher MTR translates to greater amplification of a small mass launched from earth into a large amount of materials processed in space. Cometary or similar ice can be processed to create propellant, tankage, and other useful items as described in the above-linked article. To develop space economically, instead of merely wasting large amounts of money on historical dead ends, we need to use native materials, and we need to process them with very high mass throughput ratios. Developing bases on the moon, Mars, or elsewhere in deep space without using native materials would be as foolish as if the Pilgrims at Plymouth Rock had imported all their water, food, and wood from England. Centrifuge that separates sludge from water at a rate of 200 gallons per minute. Snow cone machine (grinding ice into small bits): 67,000/yr. (In other words, the machine can convert 67,000 times its own weight in ice to "snow" in a year). Sludge separation with centrifuge: 3,000/yr. 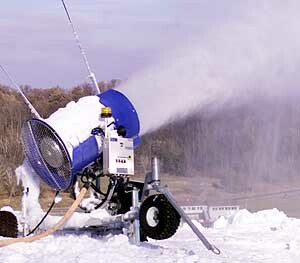 Snow making from liquid water: 330,000/yr. The MTR of a sequence of processes can be readily estimated. For example to grind ice into snow, then melt it (which I assume here has an MTR of 10,000/yr. 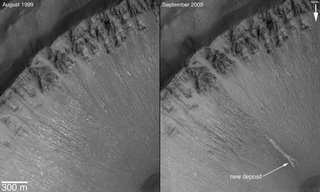 ), then separate out the dirt and organics with a centrifuge, then make snow with the now clear water -- a sequence similar to the comet mining process described in the above-linked article -- I estimate the MTR to be about 1,500 per year with the current off-the-shelf equipment. If this can be achieved for comet mining, then we can (for example) launch 10 tons of equipment and, by staying at the comet or asteroid for two years, make 30,000 tons of ice for various uses, including propellant, tankage, and radiation shielding. This is before discounting mass we lose from transporting the equipment to the comet or asteroid and ice back to a useful orbit, which will often be a factor of 10 to 20 -- see the above-linked article. Thus 10 tons launched into low earth orbit would result in 1,500 to 3,000 tons of water ice in a useful orbit such as earth geosynchronous orbit, Earth-Sun L1 (for the global warming application, link below), Mars orbit, or a wide variety of other inner solar system orbits. With a decent R&D budget we can probably actually do much better than the current off-the-shelf equipment, some aspects of which have to be redesigned for the space environment anyway (e.g. where the water flow depends on gravity). 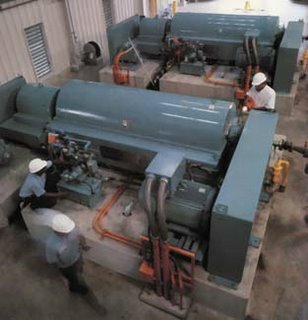 The MTRs of many of these machines can probably be improved by large factors by appropriate substitution of materials with better engineering properties (especially strength) per mass -- for example Kevlar, Vectran, Spectra, carbon fiber, or carbon nanotube for structural steel and diamond grit for grinding surfaces. Such substitutions would be too expensive for typical earthside applications, but make sense where transportation costs are very high, as with launch costs. This substitution is helped by fact that, unlike most other proposed processes for extracting propellant from materials native to space (e.g. liquid oxygen from lunar soil) these processes don't require high temperatures. On a related note, here's an interesting set of pages on the ancient art of harvesting, handling and storing ice for refrigeration. Lest this all be dismissed as mere NASA-style entertainment, there are possibly quite important applications, including combatting global warming, for which native material based space industry is crucial. (No, the idea is not to throw big ice cubes into the earth's oceans. :-) Furthermore, once the first mission returns ice, it can be used as propellant and tankage to bootstrap even more ice mining equipment. Only a few such boostrapping cycles are needed before orbital ice becomes as cheap as water on earth. Since comet ice can include methane and ammonia as well as water, it can provide the raw materials for most of chemicals and bulk materials we need in space industry. Indeed, all the above-mentioned advanced materials can be manufactured starting with these building blocks -- keeping in mind that the current earthside manufacturing processes will have to themselves be examined for MTR, reliability, and automability, and so the substitution of more simply produced materials may be in order, just as we are substituting a simpler rocket for advanced earth-launched upper stages in order to take advantage of native ice derived propellant and tanks. Of course, there many challenges with automation and reliability to be met. Some of these are being addressed by the current developments in deep sea oil and mineral extraction, which I am currently researching and will hopefully cover in a near future post. 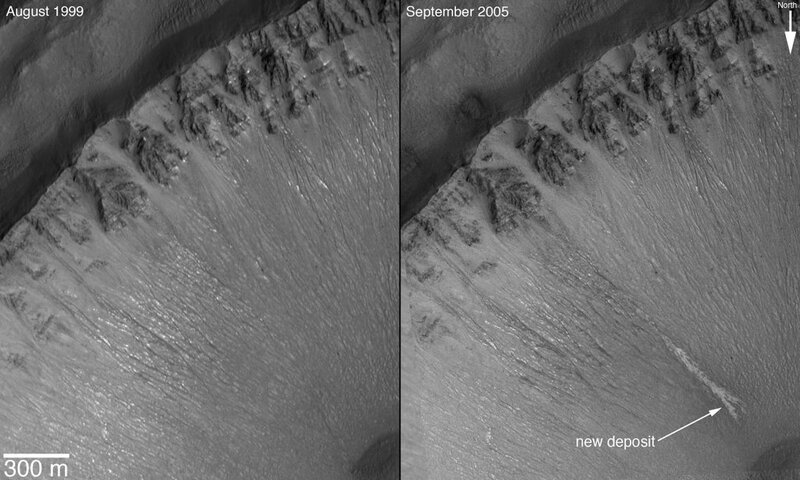 Here is recent evidence of not just ice, but (at least temporarily) liquid water underneath the Martian surface that has flowed out onto the surface and frozen. Mars itself, in a deep gravity well, is not an ideal source of water for use beyond Mars, but ice there suggests that ice might also survive near the surfaces of some asteroids that lie even farther from the sun. I've written about geographic patterns that demonstrate the importance of securing as well as producing wealth (link below). These have shaped forms of government and law. Hunter-gatherer tribes, under which our instincts evolved, had no need of large organizations, governments, or law as we know it. The dawn of agriculture was probably made possible, not by the discovery that food plants could be grown from seeds (this would have been obvious to a hunter-gatherer), but in solving the much harder problem of how to protect this capital investment over the course of a planting-growing-harvesting-storage cycle from fellow human beings. This required internal law and external security exercised much more thoroughly and over a larger area. It was securing the production, more than the production itself, that required eventually radical organizational evolution. Once farmland became the main source of wealth, there were substantial economies of scale in protecting it. This posed a difficulty in forming organizations larger than tribes; those cultures that could coordinate larger militaries slowly displaced tribes that could not. This led to a wide variety of governmental forms, but they tended to have in common that the military consumed the bulk of the otherwise insecure agricultural surplus. The primary legal form was that of real property, usually claimed by military lords and their heirs. The next phase appeared sporadically and temporarily among city-states that dealt most in goods (included harvested and transportable agricultural commodities) rather than farmland. As cultures became centered around trade and industry, converting from farmland to goods as the main source of wealth, they also tended to convert to from feudal monarchies to republics (or as we tend to call them now, democracies). Contract law became as or more important than real property law. Real property became much more alienable, either sold outright or pledged as security for insurance or investments. As most wealth became mobile, taxes became centered on trade and income -- on wealth transfers that require crossing borders or crossing trust barriers -- rather than on wealth. During the same centuries as the rise of republics, cheap paper made widespread monolinguistic merchant communities more effective. The printing press gave rise to modern national languages, making large-scale organizations such as the modern corporation and nation-state possible. This led to substantial efficiency gains both in the security of production (and of the accompanying trade) as well as in the production and trade themselves. Technology and economy have now once again leapt ahead of government and law: now in the most developed countries it's no longer goods, but services and information, which increasingly create wealth. It's still almost anybody's guess what organizational forms will be needed to produce and secure service value and information wealth, and for that matter whether such wealth will take the legal forms that have appeared with goods-centered republics (e.g. patents and copyrights) or whether new more security-efficient forms of property and contract will emerge. I expect smart contracts and related protocols to play an important role. More about security and history here. Parts of the trend towards smart contracts are advances in vending machines. Indeed, a vending machine is a very ancient kind of smart contract, supposedly going all the way back to coin-operated holy water dispensers in Ptolemaic Egypt. It's important that the machine be as fair as possible to avoid either the vendor or the customer being cheated. But it's tricky. "[T]o prevent the thing snagging and you getting ripped off," Motorola's machine is designed so that "your card is only charged when the sensors detect you removing it from the bin." There's a flower-vending machine where you can either buy fresh flowers from the machine itself or order flowers sent somewhere. There's a machine that loans soccer balls. The user interface is your cell phone instead of on the machine itself. The balls are tagged with RFIDs, a primitive form of proplet, so that the machine can tell when you've stolen a ball (or at least when you've removed it out of the allowed area of use) rather than returned it. The machine also keeps a social register of soccer players to help you find somebody nearby to play with. This is moving us far from the traditional vending machine and towards a far wider variety of automated transactions heretofore enforced by contract or property law rather than computer protocol. Japan, as a low-crime and gadget-loving country, fields machines selling a wide variety of products and services. There's a refrigerated locker where you can store your groceries and continue shopping and a machine where farmers can put in money and polish their rice. Some machines take 10,000 yen notes (about $80). Some parking machines place bars under or in front of the car that prevent the car from being removed from the spot until the fee is paid. 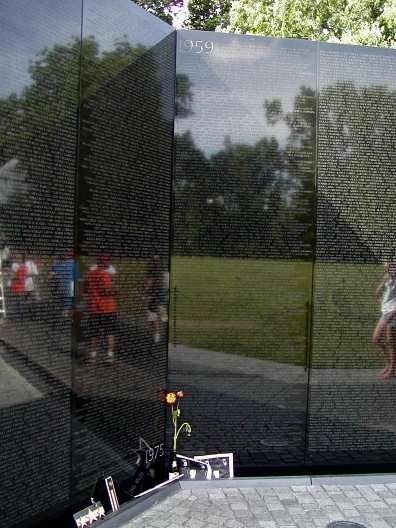 Maya Lin's Vietnam Veterans Memorial is the only major memorial in the United States capitol showing the names of the deceased. 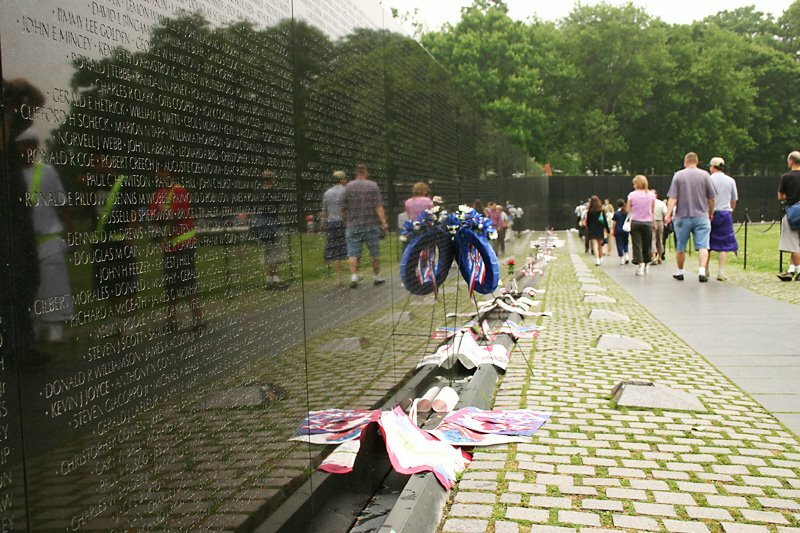 The other major memorials in D.C. are paeans to the politicans who put soldiers and civilians in the path of death and destruction or to the environments where the destruction took place. For example, the World War II Memorial echoes concrete bunkers and gun batteries. 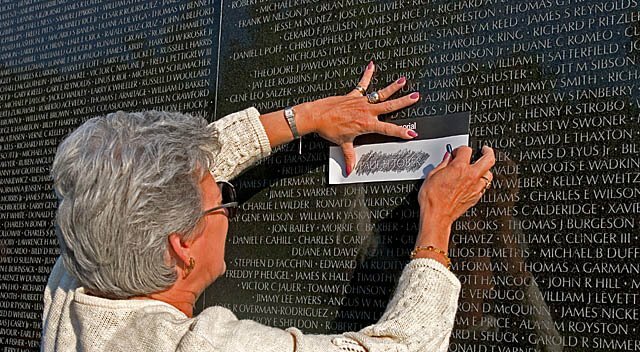 In contrast the Vietnam Memorial is an interactive experience where loved ones can come and remember those who actually sacrificed by leaving pictures, flowers, or flags and taking rubbings of their loved one's name.